The Optimus F7 is the better-spec'd of the two mass market LTE-enabled phones by LG. It packs a 4.7” True HD IPS screen of 720p resolution and 312ppi. The Optimus F7 has a 1.5GHz dual-core processor with 2GB of RAM – not as powerful as the Optimus G's, but it borrows the QSlide multitasking and Live Zooming (pinch zooming for playing videos) of the LG flagship. The back of the F7 has a nice looking pattern. It’s somewhat similar to that of the Nexus 4, but the effect isn’t as good. The LG F-series is all about connectivity and, more specifically, LTE. The Optimus F5 is at the low end of the range, while the F7 is the premium offering. The F5 is built around a 4.3" IPS display of qHD resolution, and it's actually quite a pleasant one at that. It treats you to accurate colors looking at the screen head-on, but quickly loses ground as you tilt. The display is also quite reflective, which could be a problem when using it outdoors. Powering the phone is a 1.2GHz dual-core processor and 1GB of RAM. They help it run Android 4.1.2 Jelly Bean skinned with LG's Optimus UI. Everything was moving at a good pace and we didn't experience any lag with the UI or delay in opening apps. We should also mention the cool features that come with the latest iteration of the Optimus UI skin. One of them is Live zooming, first seen on the Optimus G. Multitasking is enhanced thanks to the upgraded QSlide features allowing you to open two apps at the same time. You can change the size, position and the transparency of the apps you've opened. Those include video, browser, memo, calendar and the calculator. With such a heavy belt of features, the 2,150mAh battery sounds decent for a midrange smartphone of this size. The good news is that LG has managed to keep the F5's waistline at the reasonable 9.3mm. In fact, the F5 is really pocket-friendly at 126 x 64.5 x 9.3 mm. It's an all-plastic device, with a chrome-like side frame. Both the white and black versions are prone to fingerprints, but they are a lot less prominent on the white one. User available storage is just short of 8GB, but is expandable via a microSD card slot (up to 32GB). At the back, there's a 5MP autofocus camera, compete with an LED flash. It can also record 720p videos at 30fps. A 1.3MP camera at the front takes care of video chatting. Overall, the F5 offers quite a lot: LTE, a dual-core CPU, Android 4.1.2 Jelly Bean (we all know how LG updates their phones), and an OK display. It should do well on markets where LTE has proper penetration. LG has refreshed their L-series of smartphones for 2013 renaming the whole line-up to L II and the L7 is the best-equipped of the trio. Since the L-range is more value-oriented and generally cheaper than the F-series, the L7 is close to the level of equipment of the F5. 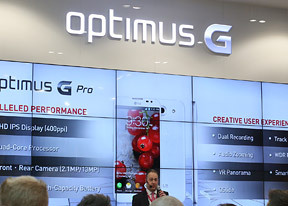 As such, the Optimus L7 packs a 4.3-inch display producing 480 x 800 pixels of resolution. This rounds up to the reasonable 217 pixels per inch. Colors are alright, as well as the brightness. The L7 is running Android 4.1.2 Jelly Bean, with the Optimus UI skin. Powering the device is a Qualcomm MSM8225 Snapdragon chip with dual Cortex-A5 CPUs running at 1GHz. It doesn’t sound particularly exciting, but manages to keep the system going at a good pace. As for the actual design of the device, you can tell it apart from the F5 and F7, as it lacks a home button, replacing it with the classic four-button Android arrangement of capacitive controls. Like the rest of the range, it’s all plastic, too and measures 121.5 x 66.6 x 9.7mm. There’s also a dual-SIM version of the phone (as a matter of fact, each L II-series member has one) and it’s simply dubbed L7 II Dual. We were told that it supports dual SIM standby. LG has also included a separate capacitive key on the main row of buttons below the screen to manage SIMs. Here are some hands-on photos of the phone. All in all, the L7 II is very nice to hold and touch, despite its glossy plastic finish. Its fingerprint-prone but not too bad.